Richard Linklater’s LAST FLAG FLYING will open in the UK and Ireland on 26 January 2018, through Curzon Artificial Eye and Amazon Studios. The film received its world premiere as the opening night of New York Film Festival, followed shortly afterwards by a European premiere at the BFI London Film Festival. In 2003, 30 years after they served together in the Vietnam War, former Navy Corps medic Larry “Doc” Shepherd (Steve Carell) re-unites with former Marines Sal (Bryan Cranston) and Richard Mueller (Laurence Fishburne) on a different type of mission: to bury Doc’s son, a young Marine killed in the Iraq War. Doc decides to forgo a burial at Arlington Cemetery and, with the help of his old buddies, takes the casket on a bittersweet trip up the East Coast to his home in suburban New Hampshire. Along the way, Doc, Sal and Mueller reminisce and come to terms with shared memories of the war that continues to shape their lives. Director Richard Linklater and author Darryl Ponicsan collaborated on the screenplay which follows the trio as they wrestle with the pangs of war both past and present. 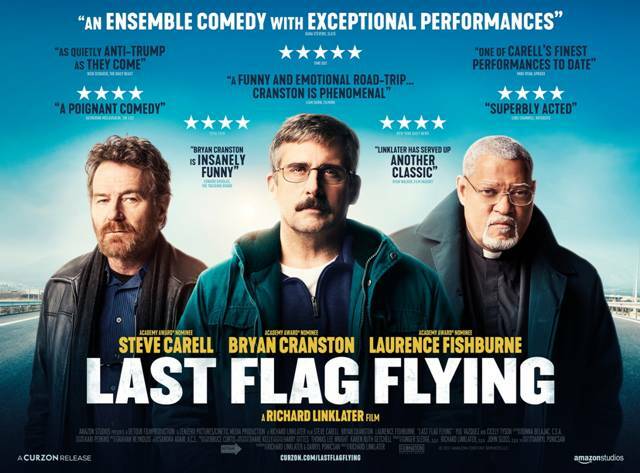 LAST FLAG FLYING stars Oscar® nominee Steve Carell (Best Actor, Foxcatcher, 2014; The Big Short, “The Office”), Emmy® winner and Oscar® nominee Bryan Cranston (Best Actor, Trumbo, 2015; “Breaking Bad,” The Infiltrator), Oscar® nominee Laurence Fishburne (Best Actor, What’s Love Got to Do with It, 1993; The Matrix, Apocalypse Now), Yul Vazquez (Captain Phillips, The Infiltrator), J. Quinton Johnson (Everybody Wants Some! !, “Hamilton”), Deanna Reed-Foster (Southside with You, “Chicago Fire”), and Oscar® nominee Cicely Tyson (Best Actress, Sounder, 1972; The Help). LAST FLAG FLYING is directed by Richard Linklater (Boyhood, Before Sunrise, Dazed and Confused), written for the screen by Linklater and Darryl Ponicsan (The Last Detail), and based on the novel by Darryl Ponicsan. There will be a special satellite Q&A screening on the 21st January at Curzon Mayfair. Tickets go on sale for Curzon sites today and partner cinemas on Monday 8 January.